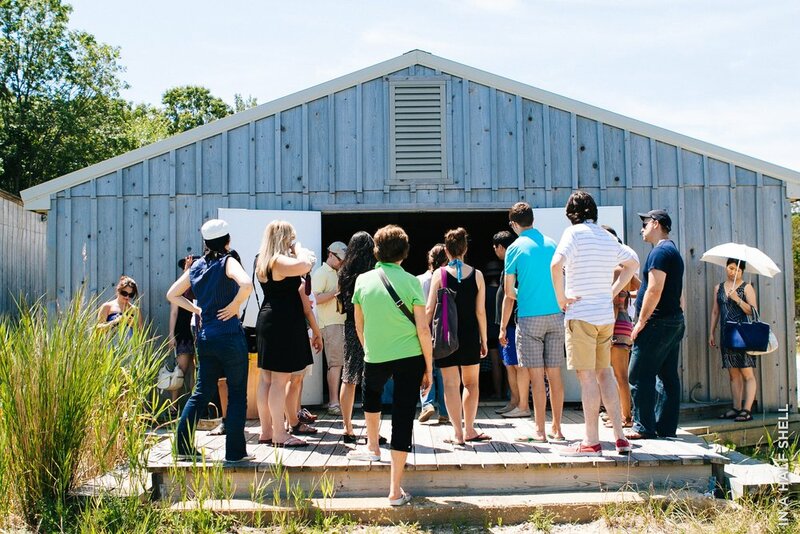 The second annual New York Oyster Lovers field trip took over 30 (!) enthusiastic members out to the North Fork of Long Island, where we toured the Shellfisher Preserve with Karen Rivara and Widow's Hole Oyster Farm with Mike and Isabel Osinski. The perfect weather, delicious oysters, fun group, and welcoming hosts made the day nothing short of amazing. We chartered a comfy 28-seat passenger bus to whisk us to the farms. Although I arrived 10 minutes early that morning, nearly everyone had already boarded the bus. Talk about having an eager group! The ride out of the city was smooth and traffic-less. Our first stop was the Shellfisher Preserve. The Shellfisher Preserve is the site of the former Shelter Island Oyster Company shellfish farming facility located in Southold, New York. The Shelter Island Oyster Co was a big player in the industry up until the 1950's. In 1996, the owning family donated much of the property and their unique facilities to the Peconic Land Trust. Since the acquisition, the Trust has been working with the Cornell Cooperative Extension Marine Program to manage the facility. Karen Rivara from the Noank Aquaculture Cooperative (the current lessee of the facility) is a key manager and spokesperson for the program. She was kind enough to give our group an intimate tour of the oyster hatchery, nursery, and growing facilities. We first did a quick peek inside the steamy, hot greenhouse. This is essentially where oyster food is grown. Many of the algae tanks were already emptied out, but some where still filled with the gooey, guava-green liquid. At various points along the tour, we were able to observe oysters at different stages in their lives. 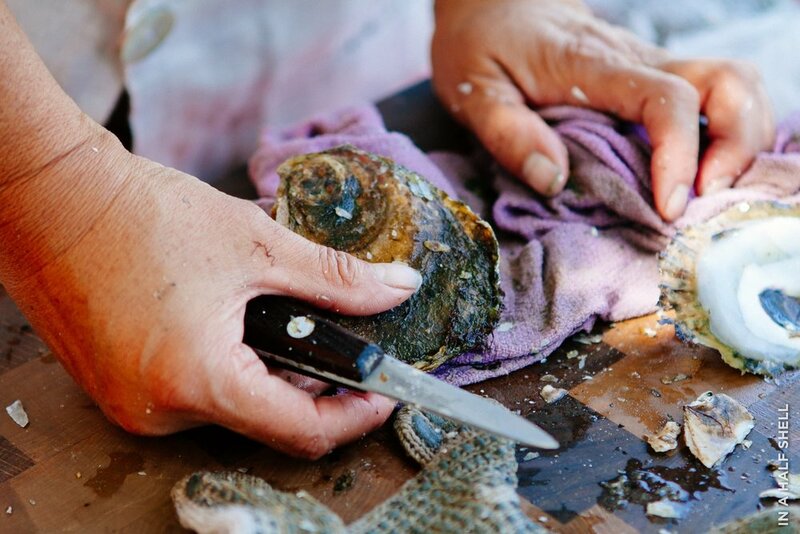 Random Oyster Trivia: Did you know that an oyster is only mobile for a very brief moment in its life? When it's a wee larva, it has the ability to "swim" about in open water using microscopic hairs called "cilia." (In reality, most of the movement is helped along by the water current.) Its main goal is to find a decent place to live... and FAST. Not unlike the frantic experience that most New Yorkers must go through when it's time to relocate. Once the larva settles onto a viable surface—such as another oyster—it will literally glue itself on and never move again. In the left photo above, you see that each baby oyster is about the size of a dime. In the wild, they wouldn't be separated into these single-serving bits. This only happens because the material that they settle on is actually a teeny, tiny particle of shell called "microcultch". Once they outgrow their landing spot, they are pretty much in control of their appearance. This process works for many commercial oyster farmers because the oysters in our beloved raw bars must meet very high standards of appearance. After the walking tour, we gathered in a shady area near the water. Karen had a big cooler of freshly harvested Peconic Pearls waiting for us, along with a much welcomed tank of icy lemon water. A few Meetup veterans (Anneliese & Bridgette) and I helped shuck for the group. These oysters were relatively easy to pop open and they were filled with salty seawater. Having plenty of liquid in the shell is a big sign that they're ultra fresh! We wrapped up at Karen's farm after a few hours and headed over to Mike Osinski's place to learn more about the Widow's Hole oyster operation. There's a wonderful short film about Mike and his Widow's Hole Oysters by (the lovely) Miss Liza de Guia of Food Curated. It takes place in a lush open lawn that's sprinkled with big, shady trees. Basically, it was Mike's backyard. A breathtakingly beautiful backyard, to be exact. In fact, his entire estate was breathtaking—almost magical! The house was calmly breathing, the yard beckoned for company, and the garden hummed a familiar song. I think everyone had the same thought on their minds: "Can't we stay here forever?" Gary Madden (formerly) from Lieb Cellars was also at the scene with a bucket full of delicious wines. Gary was the one who introduced us to Mike in the first place. They work together to promote their products simultaneously. Oysters and wine... not a bad idea! I quite enjoyed the light and breezy Park Avenue Summer Rosé. As you probably had guessed that this label was designed exclusively for Park Avenue Summer. Everything down to the color of the wine was taken into consideration! After a satiating lunch of grilled meats, fruits, and oven roasted veggies, Mike gave us the grand tour. The Widow's Hole operation is definitely executed on a different scale than Karen's, but the grow-out process is about the same. Despite the similar processes and relatively close locations, there were distinct differences between the two oysters. Both the Widow's Hole and Peconic Pearls were quite briny. They truly reflected the taste of the sea. However, the Peconic Pearls were a little more complex in flavor. An earthy, nutty minerality surfaced in many of the Peconic Pearls. Widow's Holes were much brighter and cleaner. They were crisp and straightforward in taste. Around 4PM, we all reluctantly boarded the bus again. Everyone was beat, but happy. Overall, the trip was a great success! I think that all of the Meetup members learned a lot and had a blast. I hope to organize another one before the end of the year.